Preferred daily diet for larger goldfish and baby koi providing them the basic nutrition they require to live a long and healthy life. Includes all the nutrition your goldfish or baby koi need to grow strong and look great. 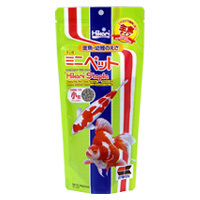 To enhance coloration, supplement daily Hikari Staple mini feeding with Hikari Gold mini.